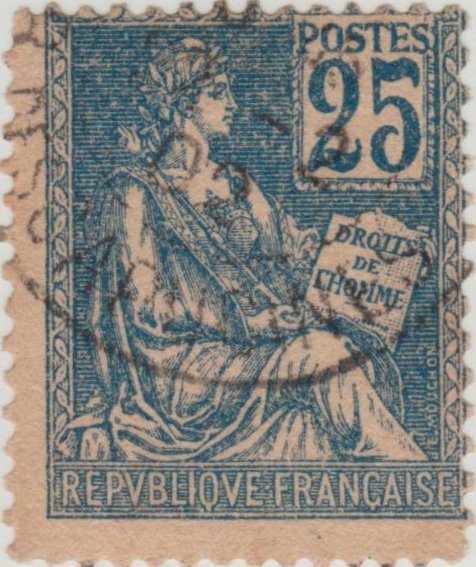 I was looking at my early French stamps and saw that some of The Rights of Man issues can be found with the numerals printed separately. Scott states that in the 10c and 25c values, the first printings show the numerals to have been impressed by a second operation whereas in the later printings the numerals were inserted in the plates. Two operations were used for all 20c and 30c and one operation for the 15c. I have looked at my stamps of this series and think I have identified both types for the 10c value. I would like someone more familiar with early French stamps to confirm my finding. The first stamp I believe is 116 I believe this is 116a - The numeral 10 is heavier and darker than "Postes"
I wasn't aware of this, so I sneaked a peak into my Michel catalog. With the 10 cent an easy tell is the base of the one being curved vs. straight. Butterflies, thanks for the confirmation on the 10c. Does your Michel catalog specify how to differentiate the 25c stamps. MikeC99 , no mention is made of a difference for the 25; though, from viewing those you showed, I'd expect the separately-stamped 25 to be a bit thicker,etc. I looked up the issue (1900 type Mouchon) in the GPFS site. They show a dot between the 2 and the 5 for their type II and almost no difference in letter shape. The second time I used this link it took me to the index instead....in that case you need to go to catalog...europe..france...work your way to 1900 and get the english version. I'm not trusting those images really. Would like to get additional confirmation. I have a 25c with no dot and find it hard to believe that I have the early rare type. Also the tail of the 2 is thicker on my stamp, so fine details in numeral shape apparently don't count? Starting to understand the site a little better now. The "type - varieties" box apparently shows a sub type not mentioned by Scott. To compare 119 with 119a look at series 38 image(later single printing) vs. series 37 image(early separate printing) listed on the site. Butterflies is correct in distinguishing the 10c stamp. The 25c printings are primarily distinguished by breaks in the frame line, as the numerals are the same (disregarding closed loop varieties). MikeC99 has already shown and correctly identified the two 10c printings in the OP. For 25c stamp, the numerals are identical for both printings (disregarding closed loop varieties). The difference is seen in the breaks of the tablet frame line. If the denomination is clearly off-center in the tablet or of different color shade, then the stamp should be a Type I (2-step) printing. You can see these 2 qualifiers very clearly in Mike's #116a. However, well-centered denomination of same color does not guarantee Type II, as some Type I printings can be "near-perfect". The best way to distinguish are the "1" base test for the 10c and the frameline test for the 25c. I have both 25c printings. I will try to dig them out and scan them later so you can see the difference side-by-side. Butterflies , khj , thanks for your help in this matter. I have two 25c stamps and I am not entirely sure if they are the two types no matter how much I look at them with my magnifying glass. Please confirm whether I am correct in my assumption. Below are cropped images of the two stamps. I think the one on the left is 119 because the inner frame line of the value tablet is broken on the right side and bottom right. The numeral appears darker than the other stamp. The stamp on the right has a more continuous inner frame line and the numeral is lighter. Yes MikeC99, you have them correctly IDed. Right stamp is Type I (#119a): no obvious breaks in framelines, numerals of slightly different color shade (although this particular stamp is pretty well-centered), gap between thin framelines is barely there in some places (on other stamps, you often will see the thin framelines "merge" into one thick line, especially at the bottom left; see my #119a). khj , thanks for the confirmation Kris. I'm looking at my early French stamps and finding identification of some to be a challenge. 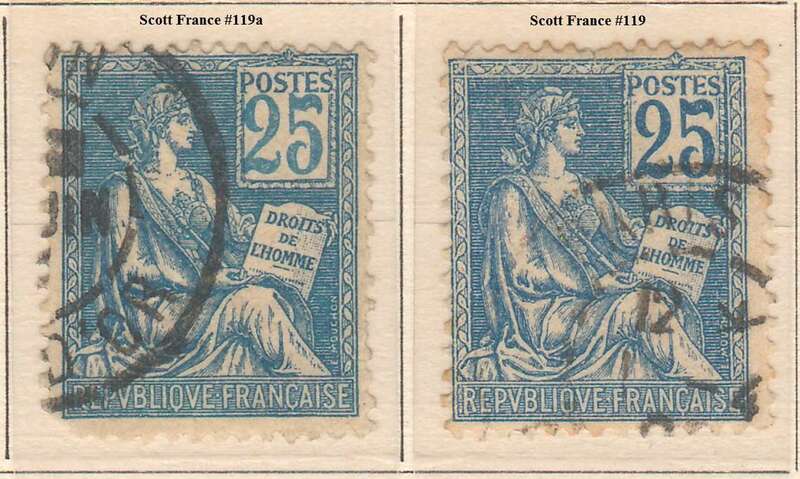 Unfortunately Scott is not a good reference guide for these French stamps. khj , thanks for the confirmation Kris. I'm looking at my early French stamps and finding identification of some to be a challenge. Unfortunately Scott is not a good reference guide for these French stamps. Agreed. I have a fairly significant classic France collection, so feel free to ask/post. Even if I can't give you an answer, others will chime in, and we'll all enjoy seeing your stamps!